Join our mailing list and subscribe to our newsletter. Check in periodically to stay up to date with everything that’s happening at CMA. You’re Invited to CMA’s Open House Party! Come celebrate the conclusion of our first, one week workshop during our open house party and sculpture viewing! On May 11th, the results of our “Hot Rivets: A Collaborative Sculpture” workshop taught by visiting instructor Steve Howell will be on display on the grounds of CMA. The sculpture is inspired by the industrial heritage of Johnstown and created using the very same iron working techniques this influential city was built upon. The party starts at 4 p.m. on Saturday, May 11th and goes till dark! Please join us for a fun and informal celebration, hor d’oeuvres will be provided and feel free to BYOB! Steve has been immersed in industrial arts all his life. He is currently the director of production at the Sahale fabrication shop in Seattle, Washington. Steve’s deep personal interest in metal fabrication bore fruit in 2008, when he succeeded in recreating a complete set of tools and processes for reintroducing the lost art of structural hot riveting. His background in steel fabrication and testing includes offshore welding in the Gulf of Mexico, quality control and inspection of components for the B-2 Stealth Bomber, the F-22 fighter, and Abrams tanks. 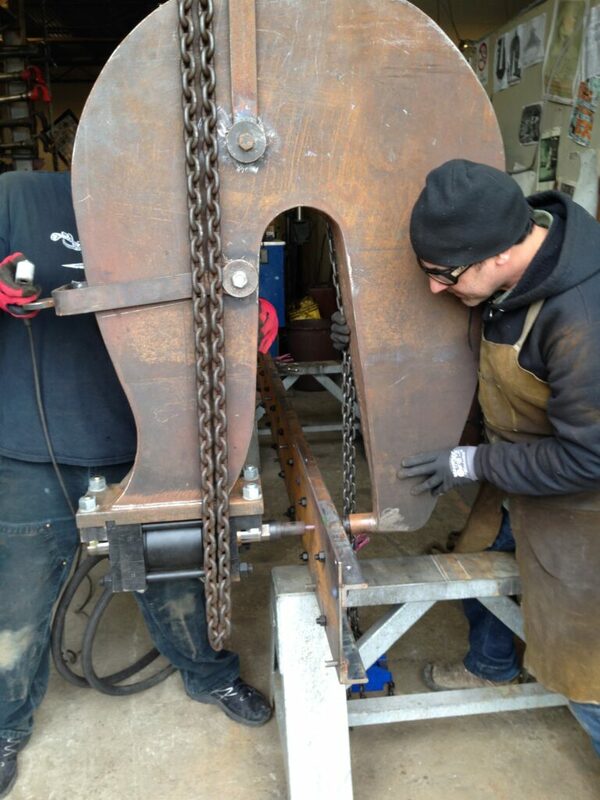 Students will be creating a collaborative sculpture combining forged elements, structural steel shapes, and riveted joinery to break through barriers of perception and monotony. The riveting technique allows a designer to leverage ideas where one rivet is not a big deal, but six million will get you a monument. Prior forging skills are highly recommended. The class will focus on forged sculptural elements, layout on structural steel shapes, and then will look at creative ways to join the pieces utilizing pneumatic and hydraulic riveting techniques with presses Steve will bring. Come be a part of creating a large-scale sculpture for the grounds at CMA. This is a unique opportunity to work in the same fashion things were built in Johnstown, PA when steel construction did not involve welders. Be immersed in the city that was home to one of the most significant steel mills in the country and work in the fashion it was built. If you’re interested in industrial forging, structural material, and hot riveted joinery, this is the workshop for you, hosted in one of the most inspirational settings for that style of work. For a preview of some of the techniques used during the creation of this sculpture, watch this video! Center for Metal Arts (CMA) has been established in Johnstown for almost a year – and now, CMA and the Johnstown Area Heritage Association (JAHA) are inviting the public to see what they do. On Dec. 1, five hour-long tours will be offered to showcase CMA’s current operations in the Pattern Shop, and its plans to occupy the historic Blacksmith Shop. The tours, which will be offered at 10:00 am, 11:00 am, 1:00 pm, 2:00 pm, and 3:00 pm, will include a metalworking demonstration by CMA’s principals, Patrick Quinn and Dan Neville, and a tour of the Blacksmith Shop’s interior. The tour’s nominal $5 cost will cover ear and eye protection. Tickets will be sold in advance and at the door. Advance ticket purchase is encouraged, as each tour will be limited to 40 people. Advance tickets can be purchased securely online, or in person at the Heritage Discovery Center or Johnstown Flood Museum. 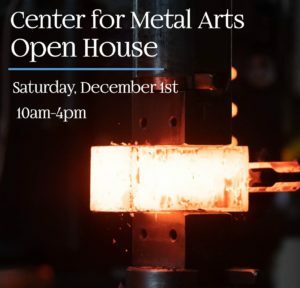 Founded in 2003, Center for Metal Arts moved their operations from New York state in early 2018. It offers educational programs open to the public, as well as specialized training for professional blacksmiths — it also creates commissioned work, and sponsors residencies. CMA estimates that 150 people have attended workshops at their facility since they opened in Johnstown. Many of these workshops take place over several days, meaning that participants spend multiple days here. “We think the experience that CMA offers visitors can help to attract heritage tourists to the city. People rarely have the opportunity to view industrial forging,” said Richard Burkert, president of JAHA. Currently, CMA’s operations are located in what was formerly the Pattern Shop, but the organization plans to move to the Blacksmith Shop as soon as is feasible, once reinstallation of utilities – compressed air, electricity, natural gas, and water — can be completed. It will take time, but equipment in the shop (some of which is in place; other items are in storage) will be refurbished and used, including the shop’s five steam hammers. Many people think of horseshoes and nails when they think of blacksmiths. By contrast, the Blacksmith Shop, which was built in the 1860s, made large-scale tools and equipment used in other sections of the Cambria/Bethlehem steelworks. Just a handful of men worked there at the time of Bethlehem’s shutdown in 1992, but as many as 100 people worked there daily in two and three shifts during its heyday of the late 19th and early 20th centuries. The Blacksmith Shop was the subject of an intensive rehabilitation effort undertaken by JAHA and the Johnstown Redevelopment Authority in the 1990s and early 2000s. In 2004, JAHA successfully applied for a Save America’s Treasures grant of $292,836 from the National Park Service to stabilize the structure. The handmade brickwork was restored using historically accurate methods – in fact, the mason who worked on it had also done preservation work on the White House. Other improvements included replacement of the roof and stabilization of the cupola, installing drainage, and other items. Also in 2004, the Johnstown Redevelopment Authority, which owns the building, received significant brownfield grant funding from the EPA for the Blacksmith Shop, which was used to install a concrete floor, mitigate environmental issues, and repair historic doors and windows. But the building was dormant for more than 25 years until Center for Metal Arts’ move, a process that was instigated when CMA’s principal saw a photo of the shop’s interior on JAHA’s social media a few years ago. Haley has been blacksmithing professionally since 2001 and with an MFA degree in blacksmithing from Southern Illinois University, Carbondale. Currently a forging instructor at Austin Community College, Austin, TX. Haley teaches a variety of blacksmithing courses ranging from introductory skills to tool making, power hammer, and sculpture. Check out his work on his website! Also maintaining his own full-time studio in Austin, where his work ranges from sculptural forged fine art pieces to architectural ironwork. Haley has been invited to exhibit and teach and demonstrate throughout the United States at a variety of craft schools and organizations, including Penland School of Crafts, Forging on the River at the National Ornamental Museum in Memphis TN, and the Artist Blacksmithing Association of North America. Haley will be teaching the popular and informative Power Hammer workshop that covers everything you need to know about forging on a power hammer! This is a great workshop to take if you own a power hammer and want to improve your skills and understanding of power hammers or are thinking of purchasing one. Covered in this workshop are all aspects of working safely and efficiently at a power hammer, open and closed die forging, top tool work and proper safety and care for the machine. This year, Haley has designed a special project: a forged and traditionally joined anchor. This project will cover closed and open die forging, swage dies under the hammer, and simple traditional joinery such as the tenons, wedges and a shackle. There are a few spots left for this informative workshop! 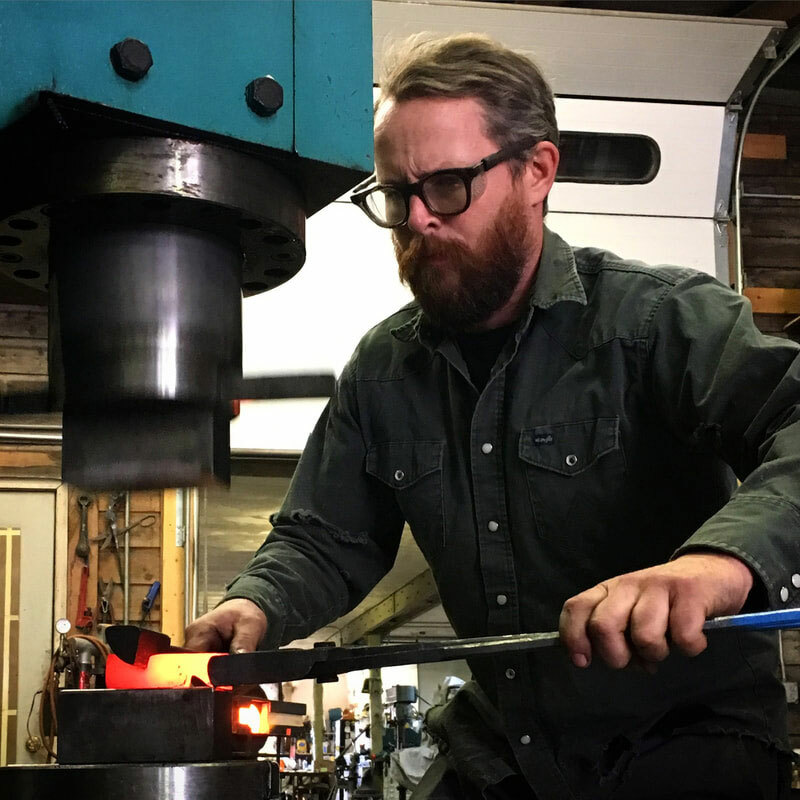 This is a great opportunity to learn from one of the best forging instructors teaching traditional and contemporary forged work in America today. Haley is a Welsh of knowledge when it comes to power hammers and all aspects of forging and working in a smithy. Taking a class with him is an opportunity not to miss. 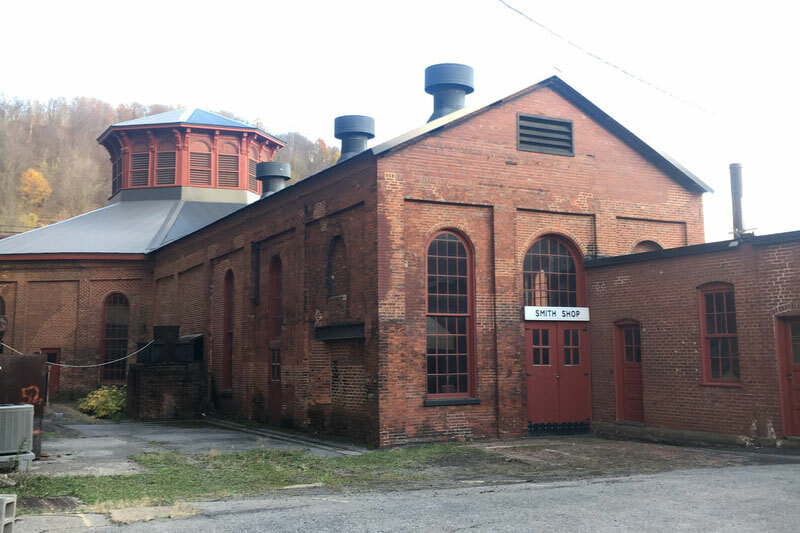 Our new location at the Cambria Iron Co. National Historic Landmark, in Johnstown PA is filled with rich industrial forging history and power hammers alike. Come check out our new location and learn new forging techniques in this beautiful location! Center for Metal Arts is Moving! We are pleased and proud to announce that The Center for Metal Arts is relocating to the historic Cambria Iron Blacksmith Shop in Johnstown, Pennsylvania. Built in 1864, this shop conducted industrial scale forgings continuously from the 1860s until the early 1990s when it closed. The site is a designated National Historic Landmark, having a historically significant and extensive collection of rare, large-scale power hammers and original hand tools forged on site. We are excited to bring this amazing asset back to life and to offer it as a facility for your learning and use. We have been hard at work with the Johnstown Redevelopment Authority to solidify an agreement to turn the Cambria Iron Blacksmith Shop into the new home of The Center for Metal Arts. This move will help us grow and develop in all of our current activities, and more. We will have the room to expand and add to our programs, to better suit students of all skill levels and from all regions of the country. Our new, larger facilities will accommodate our growing artist residency and internship programs and will allow us to offer longer-term workshops. We expect to accomplish our move quickly and to resume our regular schedule of workshops beginning in late February. After that, we intend quickly to expand the program offerings of The Center for Metal Arts in Johnstown. Stay tuned!